Daikin is the World's No. 1 air conditioning company. Daikin is a global innovator and provider of advanced air conditioning solutions for residential, commercial and industrial applications. For almost 90 years, we have created the most efficient, environmentally-friendly comfort systems enabled by extensive research. With sales in 90 countries worldwide, Daikin is revolutionizing the way people and businesses think about heating and air conditioning. Daikin designs the most advanced HVAC systems for residential, light commercial and large commercial projects of all kinds. We’re also the only company in the world dedicated to manufacturing both air conditioning systems and refrigerants. 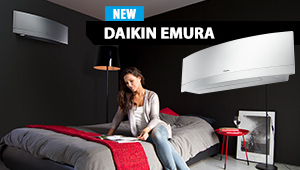 By creating some of the most unique systems ever introduced, Daikin is redefining the experience of comfort. This passion for precision means that every Daikin system — from Daikin Altherma to Quaternity and VRV — delivers maximum performance and the ultimate comfort. Daikin innovations provide energy-efficient comfort that minimizes environmental impact and helps keep your energy costs low. We offer over 20 systems that qualify for federal energy tax credits, with cooling efficiencies as high as 26.1 SEER. In fact, Daikin Altherma is one of the most energy-efficient systems in the world, with the ability to combine heating, cooling, domestic hot water and solar energy in one system. That’s why Daikin systems are popular for use in LEED-certified and Net Zero Energy projects. 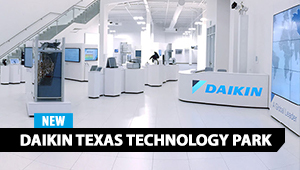 Daikin is committed to providing homes, businesses and industries with the most efficient and safest HVAC solutions to meet your cooling and heating needs, today and in the future. We are keenly aware of our responsibility to protect the environment in everything we do, and all our policies, practices and processes are developed and implemented with environmental sustainability at their heart. We conduct our business in accordance with green principles because it makes sound economical, as well as ecological, sense. Daikin has been perfecting high efficiency heat pump technology for heating and air conditioning since the 1950s. Our advanced heat pumps are more energy efficient than traditional furnaces, with the added benefits of being extremely reliable, quiet and compact. We have pioneered the adoption of this technology in 90 countries globally. 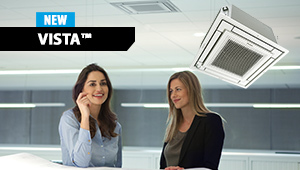 With a Daikin ductless mini-split, multi-split heat pump or VRV system, you receive a premier comfort solution, proven and backed by the largest HVAC manufacturer worldwide.